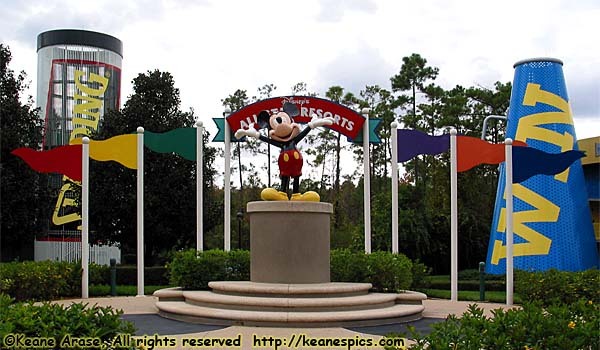 Mount Mickey, All-Star Sports Resort. I stayed there in December 2006. 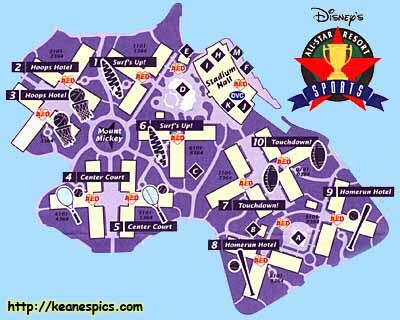 My first stay at All-Star Sports occurred when I couldn't get six consecutive days at Animal Kingdom Lodge. I could get the last five days at Disneyworld booked at AKL, but not the first day I'd be down there. I leave Chicago six hours before I wanted to (after only two hours of sleep,) to avoid a major winter storm about to hit Chicago. (The storm ended up dumping 14" of snow on Chicago, and if I *hadn't* left when I did, I wouldn't have been able to leave at all. I would have been delayed at least a half-day, maybe more.) I left in sleet and snow, where you couldn't see the lane markers; and 45 minutes later I was southbound on I-65 in Indiana, south of the cold front, and in plain, ol' rain. But a mean cross-wind. But I'll take a heavy cross wind to ice, sleet and snow, any day. At noon or so, I'm heading East on I-4 toward Disneyworld, and it occurs to me that I have *no* idea where AS...All-Star Sports is. Oh well, no problem, I'll just follow the signs. Yes, I can be that unlucky. And because of that, I'm in one of the farthest rooms from the parking lot, and the lobby/food court/bus stop. (They need a bus stop in the back of these resorts, value resorts or not.) Lobby and registration is pretty plain, bright lights with contrasty colors. This isn't a lobby that wants to welcome you, this is a lobby that you want to get in and out of as soon as possible. I'm not getting a good feeling about this. But the room leaves a little to be desired. It's small, the walls are almost bare, the table almost non-existent... I'd have to say this is minimalist Disney. It's like someone stole all the furniture out of the room, and this was the temporary stuff they put here until the real furniture arrives. I am reminded of the room at the Comfort Inn last night, which was much better furnished. And it had that delicous pork next door... But I digress. Would I stay at AS...All-Star Sports again? Probably not, unless *nothing* else was available. The place seemed...maybe not less than Disney, but the smaller rooms, more crowded resort, and the overall themeing left me less than impressed. I have to admit, that if you're on a budget, chea...inexpensive Disney is probably better than no Disney at all. And you still get the perks of being a Disney resort guest. End All-Star Resorts - Sports.